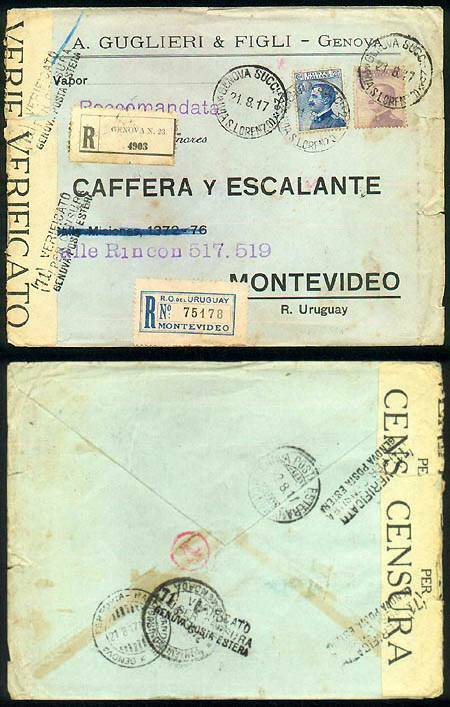 The censored, registered commercial cover was sent from Genoa. Genoa is at the northern end of the Mediterranean coast of western Italy. The sender used a preprinted envelope. and corrected the address with blue handstamps. space for designating the steamship to carry the letter. Victor Emmanuel III definitives (Scott 100 and 105). Registration was accomplished by addition of a preprinted label. I believe the CDS at the lower left on the reverse dated August 21 is a registry CDS. There are three GENOVA SUCCLE. 26 | IMA(?) S. LORENZO CDS. I hope someone can explain this CDS. Two rectangles were required to close the envelope. postal facility in which the censorship took place. reverse which appears to be dated August 22. September 21 (note CDS near left center on reverse). registry system and added a preprinted registry label. Near the center of the reverse there is a 4 inside a small circle. I believe this is a carrier mark. My thanks to Mauro Mowszowicz for providing this interesting cover.